Learn how to prepare canned Abalone, the Chinese style. Recipe for Sliced Abalone with Shitake Mushrooms. Tasty braising sauce with simmered Shitake Mushrooms. To begin, remove stems from the soaked mushrooms, squeeze out the water in the mushroom caps and set aside. Reserve about 1/2 cup of water for use later. Heat the fresh chicken stock in a pot and add in abalone broth, the water you reserved in from soaking the dried mushroom and scallops, shitake mushrooms and dried scallops. Bring to a boil, then reduce to a simmer for 20 minutes. When the liquid runs out during simmering, add more broth or hot water when necessary, a little at a time. Add oyster sauce, about 1/2 tsp dark soy sauce and 4 small cubes of rock sugar. Simmer for an additional 5 minutes. Season with additional oyster sauce if necessary, dark soy sauce for colouring and rock sugar to taste. Turn off the heat and quickly thicken the sauce immediately with cornstarch mixture until it reaches a slightly thick but still runny consistency. Add a dash of sesame oil (optional). In a meantime, blanch Broccoli florets in boiling water with a dash of salt added for about 30 seconds. Set aside. 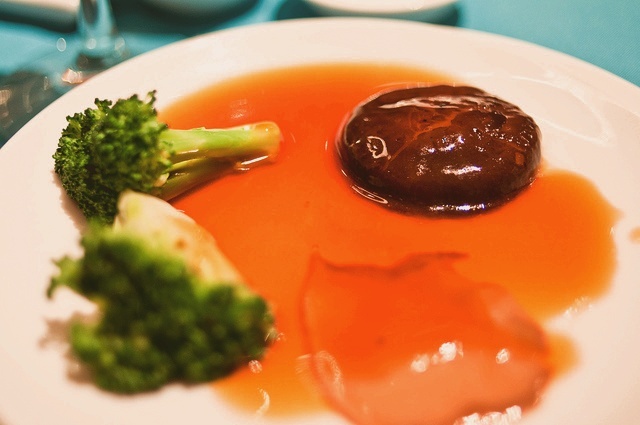 On a small individual plate, lay 1-2 whole blanched broccoli, 1-2 simmered mushrooms, one whole dried scallop and abalone slices. Pour the sauce over and serve immediately. Hi, thanks for sharing this recipe. I did not use fresh chix stock for my braised abalone. I used chicken cube instead and omitted the oyster sauce in this recipe. Taste amazingly delicious!! You can actually simmer the unopened Abalone can in a pot (double boil) in hot water for 30 mins to get a softer texture and taste. canned abalone should NEVER be cooked…. if cooked again, they will become very tough unless you braise it. If adding into soup or creating a dish, i recommend that you slice it thinly. You can also eat it on its own straight from the can. I’m so glad to finally learn how to make this dish! Now I won’t have to always get it from a restaurant.